VANCOUVER, BC / ACCESSWIRE / March 4, 2019 / Midnight Sun Mining Corp. (the "Company" or "Midnight Sun") (TSX-V: MMA) is pleased to announce initial interpretive results from a 3,889 line-kilometre Versatile Time Domain Electromagnetic airborne geophysics ("VTEM") survey conducted on the Solwezi Licences in Zambia (the "Property"). 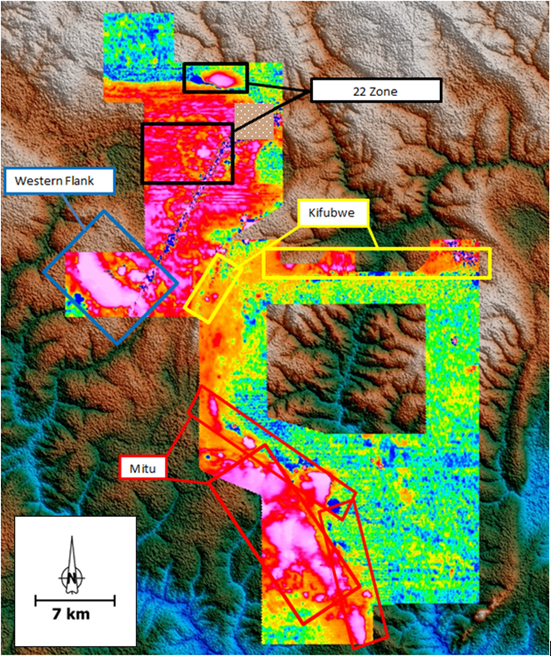 The VTEM survey has provided anomalous responses in several areas, providing the Company with previously unknown exploration targets as well as expanding the size of known targets. "This survey and subsequent interpretive work is invaluable in my opinion. 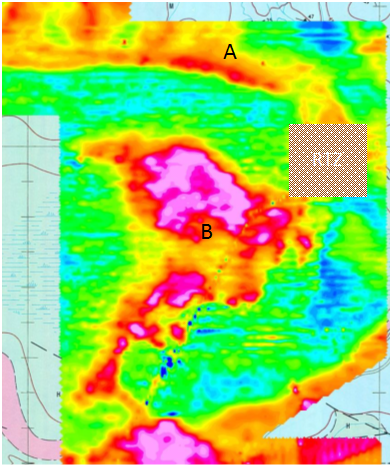 Combining the VTEM survey with existing drill and exploration data, we can now: 1) better understand why previous drill holes did or did not encounter mineralization, 2) see that the known mineralized targets are even larger than we had expected, and 3) identify well-defined anomalous zones in previously untested and unexplored sections of the Property. 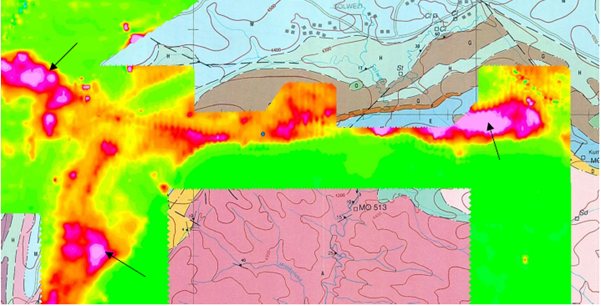 By combining the VTEM interpretations with existing data we can now gain a better understanding of the geology and controls for potential mineralization on the Solwezi Licences", states Al Fabbro, Lead Director & Acting CEO. The following illustrates and summarizes, by target area, the initial interpretations from the VTEM. To date, drilling and other work at Mitu has encountered what appears to be only one of the anomalous target areas, M1, which was the initial Mitu discovery zone. The identified M1 conductor is approximately 1km in strike and 500m in dip. The VTEM interpretation has delineated 5 other (6 in total) discrete conductors which occur near or within the favourable Upper and Lower Roan contacts and 2 of these other anomalous zones appear considerably larger than M1. "The original discovery at Mitu, which was made based on a subtle geochemical anomaly, is a remarkable testament to the early work of our technical team. Seeing the collection of even stronger anomalies that continue down the Mitu trend has the Midnight Sun team very excited for the next exploration campaign", stated Wayne Moorhouse, COO. 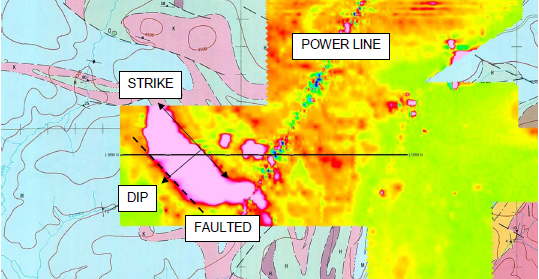 Approximately 15km northwest of Mitu, the VTEM survey has identified the largest continuous conductive trend on the Property, with approximate dimensions of 5km strike by 2km dip. This conductive trend represents a potential new discovery and occurs in the same geology as that surrounding the neighbouring Kansanshi Mine. "We were very surprised to see this prominent anomaly in the VTEM data, as the Western Flank represents a brand new target area on the Solwezi Licences. Very little historical work has been performed here by previous operators, and the massive size and scale shown by this interpretation makes it clear that appropriate investigation and attention is warranted", said Mr. Fabbro. Two anomalies in the 22 Zone area have been identified by the VTEM survey, neither of which have been directly drill tested. The northern anomaly (A) indicates a strike length of 1.2 - 1.5km and the profile suggests a deeper conductor. 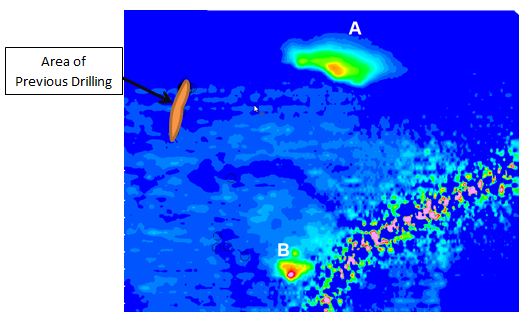 The southern anomaly (B) is within what appears to be a large dome which was previously unmapped and unidentified. The VTEM suggests a thicker anomalous zone, on trend with a major fault. Early time conductor VTEM response and geology. The response is indicative of doming in this area, similar to that which is associated with Kansanshi. Mr. Moorhouse commented, "Anomalies A and B around the 22 Zone represent an important step in the understanding of the mineralization in this area and will play a significant factor in the exploration plan to follow up on the high grade oxide intercepts drilled in 2013-2014. Identifying what appears to be a previously unrecognized dome validates speculative theories that the 22 Zone could be a Kansanshi analogue and makes us very eager to get back to work in the area." The VTEM survey identified what appears to be a chain of several discrete conductive zones located around the Kifubwe area, all of which appear to be shallow and located in favourable geology. The anomalies in this area correspond well to a 6km geochemical anomaly previously identified by Midnight Sun. Despite the fact that this area represents the largest and strongest geochemical copper anomaly reported in the country, it is located in a geological environment unlikely to respond to the VTEM system, and as such there does not appear to be a correlation between known mineralization and a VTEM conductor or spectrometer response in the Dumbwa area. 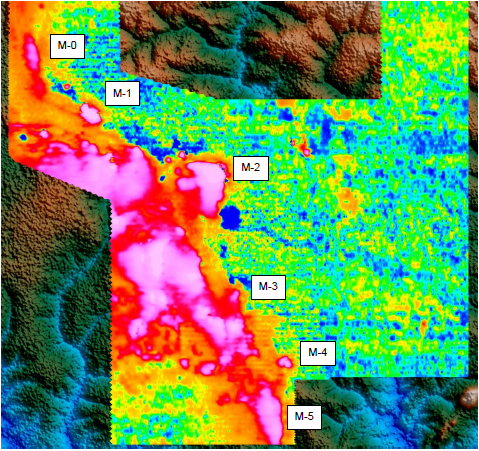 However, the information from the VTEM survey data has helped identify and delineate the complex structures in this area which are believed to be the controls necessary for potential mineralization. The helicopter-borne VTEM™ Plus B-field Horizontal Gradiometer and Radiometric Geophysical survey was conducted by Geotech Airborne Ltd. of Aurora Ontario. The survey covered 3,889-line kilometres covering the entirety of the Property. The survey was flown using a combination of 100m and 200m spacings between June 20 and July 29, 2018. As per Geotech Airborne Ltd.'s web site "VTEM™ generates currents that diffuse into the earth and, similar to water, always take a path of least resistance. Conductive material absorbs the currents and releases a secondary field that the VTEM™ system measures. A strong conductor absorbs and releases more or all the VTEM™ signal. A weak conductor absorbs and releases some or none of the VTEM™ signal." By analysing the data generated by the VTEM survey a trained technician can identify conductive zones within favourable geology. The VTEM interpretation was prepared by Stephen Balch, P.Geo. of Balch Exploration Consulting Inc. The strong VTEM anomalies are thought to be caused by conductive, graphite-rich shale units that are often the host to the disseminated copper deposits that occur along the Zambia-Congo Copper Belt. Qualified Person: Stephen Balch, P.Geo. an Independent Qualified Person under NI 43-101, has reviewed and approved the technical data and contents of this release. Midnight Sun has earned a 60% interest in the Solwezi Licences with the potential to acquire the remaining 40%. The Solwezi Licences are comprised of two individual exploration licences totalling 506 square kilometres, situated in the North-Western Province of Zambia, adjacent to First Quantum’s Kansanshi Mine; Africa's largest copper mining complex, on the prolific Zambia-Congo Copper Belt. This news release includes certain statements that may be deemed "forward-looking statements." All statements in this release, other than statements of historical facts, are forward-looking statements. Although the Company believes the expectations expressed in such forward-looking statements are based on reasonable assumptions, such statements are not guarantees of future performance and actual results or developments may differ materially from those in the forward-looking statements. Factors that could cause actual results to differ materially from those in forward-looking statements include, changes in market conditions, unsuccessful exploration results, changes in commodity prices, unanticipated changes in key management personnel and general economic conditions. Mining exploration and development is an inherently risky business. Accordingly, the actual events may differ materially from those projected in the forward-looking statements. This list is not exhaustive of the factors that may affect any of the Company's forward-looking statements. These and other factors should be considered carefully and readers should not place undue reliance on the Company's forward-looking statements. The Company does not undertake to update any forward-looking statement that may be made from time to time by the Company or on its behalf, except in accordance with applicable securities laws. SOURCE: Midnight Sun Mining Corp.